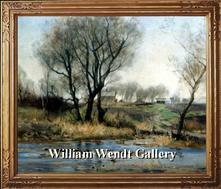 Guide to selling your William Wendt painting! 1. We would like to see images (photos) of the artwork -- overall photos of the front and back, one of the signature, and closeups of any labels, titles or inscriptions on the back are very helpful. 2. Sometimes, we can meet you at a location convenient to you so that we may view the painting in person. 3. Please tell us the size of the painting, excluding the frame. 4. Is it an oil on canvas, watercolor or print? 5. Please submit ALL William Wendt paintings for consideration regardless of condition, we understand that most vintage paintings show wear and tear to one degree or the other -- even paintings with significant damage can still have considerable value! 6. We also would like to know the interesting history behind your painting, it is fascinating to us that each painting has a story to tell -- was it purchased directly from the artist, was it purchased at a gallery, did it descend in the family? 7. Payments are quick and discreet, we are flexible in our payment arrangements.